It’s not a surprise that sometimes I miss a story when I write “Today’s Headlines.” It is equally unsurprising when someone emails me a link to a missed story. It is something of a surprise when the person emailing me is an editor at the Los Angeles Times. But yesterday, all of those things happened. Paul Thornton, an editor with the Los Angeles Times’ Opinion Page, sent me a link to this piece on the status of the 3 Foot Passing Law by Robert Greene. Thornton announced the piece as the first step in a broader program to increase coverage of cycling issues in the Opinion Page. My first thought was, oh no…not another Summer of Cycling. My second thought was more positive. The Times is reaching out to us because they want to do better than the Los Angeles Newspaper Group’s bizarre mish–mash of opinion pieces from this summer. So, let’s help them. The Times’ own 2009 mini-series on the “state of cycling” was much better than the Newspaper Group’s effort from this year. But it could still use some improvements. Readers, please leave your suggestions in the comments section. I know they’ll be reading. You can read my top five suggestions after the jump. 1) Please, for the love of God, please; ignore the “us v them” style of writing about bicycling. It’s old. It’s been done to death. It doesn’t really represent anything other than the most extreme parts of the debate. Greene played with this trope a little at the end of his article, but I think he was mocking it more than using it. It’s a good start. 2) There is a wide variety of thought within the cycling community on most issues. For example, there is a group of cyclists known as “vehicular cyclists” that believe that if cyclists just behaved as car drivers do most issues would go away. 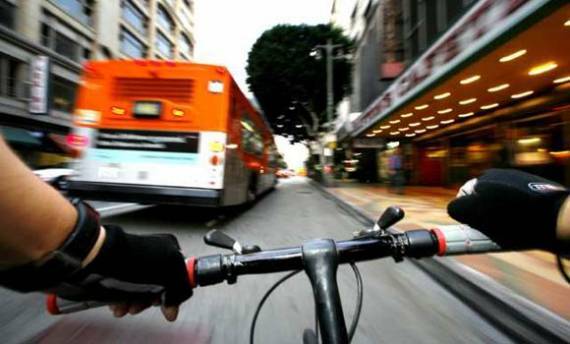 They oppose three foot passing laws, green buffered bike lanes, and most types of bicycle infrastructure that enjoy the support of groups such as the Los Angeles County Bicycle Coalition (LACBC). Cyclists do not engage in group-think. 3) Villaraigosa’s broken elbow gets a lot of credit for the change in policy and direction in the city, but in truth there was a lot of work put in by a lot of people to create the turnaround. In 2008, the LACBC was struggling to survive, Cyclists Inciting Change Through Live Exchange was about to go through a leadership change, Streetsblog had one part-time writer in L.A., there were two storefront co-ops in city limits and nobody had ever heard of CicLAvia. In 2013, LACBC and CICLE are thriving, there are five storefront co-ops in city limits, and even Streetsblog has a wide and diverse staff. Everyone knows what CicLAvia is. This isn’t because of political leadership, this is the result of grassroots leadership and hard work. The movement has grown beyond just advancing the cause of thousands of cyclists to a fully-developed campaign for safer and better streets for all road users. The wider message has led to more funding, more staff, more diversity and a more powerful voice. 4) Speaking of leadership, can you find out what Eric Garcetti’s transportation plans are? There are high expectations for a mayor that doesn’t need a special event to ride a bicycle, he even joked with us that he was going to close all streets to cars during a sound check during the campaign. But he’s been quiet on the transportation front outside of some motions on the Metro Board of Directors. 5) I’m not asking that every op/ed be written by car-free cargo bike owners who ride Critical Mass, but could at least some of the stories be written by actual cyclists. I’m not counting a story that starts with the heroic tale of someone getting a rusty Huffy from the 1980’s from the back of their garage and riding it to work one day…I mean someone who experiences what it’s like to ride on L.A.’s streets. Good post, but one correction: I’m an editor at the opinion pages, not the opinion page editor. My primary responsibility here is letters to the editor; for our bike project my main job is reader/social engagement. More coverage of the diversity of bicycle use in LA–the young white hipster narrative gets old, especially when LA’s bicycle demographics are anything but. And Damien doesn’t have the authority to promote you? 1) Road rage towards bicyclists: Some drivers think bikes shouldn’t be on the road, and there are far too many bicyclist collisions and deaths each year as a consequence. Where is LAPD to remind drivers to be nice? The city should make zero bicyclist deaths a priority. 2) The downward trend in interest in car ownership among the 18-35 age group directly corresponds to the increase in bicycling, and there is no sign of either trend slowing down. Public hearings and neighborhood council meetings on LA’s westside illustrate this demographic rift: opponents of new bike infrastructure are, almost without exception, white and middle-aged or older. Supporters are far more diverse but skew towards the younger side. (I’m 29, have been biking for a year, and have a car I rarely use.) If the city’s goal is to plan for the future, it no longer makes sense to treat car traffic as the pressing problem it has been for decades. 3) Lack of citywide bikeway connections: LADOT has so far only installed new bike infrastructure on street segments that it considers the “low-hanging fruit.” For anyone who wants to bike crosstown (north-south or east-west) there is still a great deal of uncertainty involved, which is very discouraging to any but the most daring and dedicated riders. More crosstown bike lane connections mean more people on bikes, which means fewer cars on the road. Yes, recognition of the different forms cycling takes across LA is important, particularly in lower-income areas. And, with that, recognition of the different barriers to being able to ride safely in streets that people face. Infrastructure fixes in one neighborhood don’t necessarily work in another. Similarly, mantras that hold true in better-off parts of town (“Bikes mean business!”) are not true in others where biking is not a choice and people have limited disposable income… but it doesn’t mean that making those places more bike-able is a bad investment. In fact, those are some of the places that need the most investment. So, yes, please — coverage of diversity! Further to the “us vs. them” thing. It’s a trivial observation (though one that people keep forgetting) that everyone spends some part of every day moving around without using a car. (I would say walking, except that there may be some people that are always in a wheelchair or something similar.) I’m sure some of the staff at the LA Times have those pedometers or FitBits or other step-counting devices. It would be interesting to do a few interviews or profiles where you set someone up with one of those devices, and have them time how much of the day they actually use a car, how much they actually use a bike, how long they are actually on transit, and how much they actually walk. Most people who are on a bike at any time spend some significant percentage of time using several of the other modes, and I’m sure the reverse is true too. The LA Times could totally re-write the transportation and public safety debate by covering car crashes with the same breathless coverage reserved for the one bike vs. pedestrian crash in California that resulted in a fatality. A body count blog would go a long way in framing the issue as a cars vs. people issue and not “accidents” and “tragedies” that are framed as “an unavoidable consequence of living a modern life of convenience”. Who will advertise in this section? LAWYERS. Whether or not LA has congestion, I think a more fundamental problem is that LA’s people and LA’s ability to pay for its needs as a city are totally off the radar – and because of this the LA Times and most mainstream reporting feels as fruitless to read as it must feel to write. Only a few years after Occupy LA and City Hall is acting as a conduit for several million from all the big Wall Street banks to pay for “youth employment” and these same banks are searching for minority businesses to hand over symbolic loans to? Even the most ardent Tea Party SFV secessionist is going to be interested in that. Bikes themselves deserve a Cycle Chic photographic treatment, with the clothes of everyday Angelenos splashed on whatever pages you want to show what someone fabulous was wearing on a bike ride the other day. You can expect that to open up your pages to more than car dealership adverts. Expecting the same paper that did its level best to eliminate the green bike lanes on Spring Street to treat cycling issues with the respect they deserve is probably asking for too much. I ride bikes. I mountain bike on the weekends, group road ride during the week, bike commute 3-4 days a week, ride on tracks, at skate parks, and with my kiddos around the neighborhood and local parks. Weekly, I put in roughly 100 miles and 10K feet of climb. However, I do realize that bikes don’t fit into the transportation equation for many. My 80 yr old mother in law won’t ride bikes. My mom is not fit enough to handle most of the inclines around here. My wife, who shuttles our kids to and fro from school to karate to music classes to ballet, etc.. is not going to use a bike for that, and public transport doesn’t cut it. That’s all I have to say, really. Completely agree. The depiction of cyclists seems to be predominantly of aggro bike messengers, entitled hipsters, or lycra-clad triatheletes. While all of these stereotypes might be found in some small portion of L.A.’s bike riders, they definitely aren’t representative or even fit within the top demographics. Please cover the issues facing cyclists that happen to be kids, women, low-income workers, and/or immigrants. That means road safety education, access to school and work, bicycle lanes, protected bike lanes, profiling and harassment by law enforcement, police and public confusion over traffic laws, public transportation, bicycle maintenance, riding groups, driver entitlement, the hit & run epidemic, ghost bikes… I could go on. My coworkers think I’m crazy for riding my bicycle in DTLA. Film production vehicles block bike lanes on a daily basis. Many busses don’t respect bike lanes. It would be nice for LAPD to respond to cyclists’ issues positively. Some excellent suggestions here (especially having stories written by people who know what it’s like to actually try to commute to work or school or run errands by bike; and coverage not simply focusing on MAMILs). I’d also urge the LAT to look at bicycling in the context of larger transportation and social issues. For example, linking bicycling and transit, insofar as the two modes are linked for most people who get around without a car (by choice or by necessity). Or, for another example, the lack of safe routes to school and the epidemic of childhood obesity. And, as others have mentioned, attention to bicycling and different socio-economic issues. And, don’t just focus on DTLA. Lots of us ride and commute in the suburbs. Finally, I’d like to see some attention to the barriers–especially infrastructure that’s not bike-friendly–to more people being able to ride. The family was told they would be lucky if the drunk driver that killed their loved one got five years. Most likely, she’ll get a fine and some probation, maybe a few months in jail. If she had shot him, even accidentally, she’d be looking at way more time, yet the result is the same–a dead young man and a devastated family. Another young man was mowed down leaving church in South LA a few hours before this incident. They’ll probably never find that driver. There’s just too much carnage and it’s not being taken seriously enough by the city, law enforcement, or the judicial system. Open Thread: So, How’d I Do?